Mineshaft is a fairly easy level that features vertical gravity lines and far too much silly writing! Feedback would be lovely. Design stuff after the break. Play the level first! 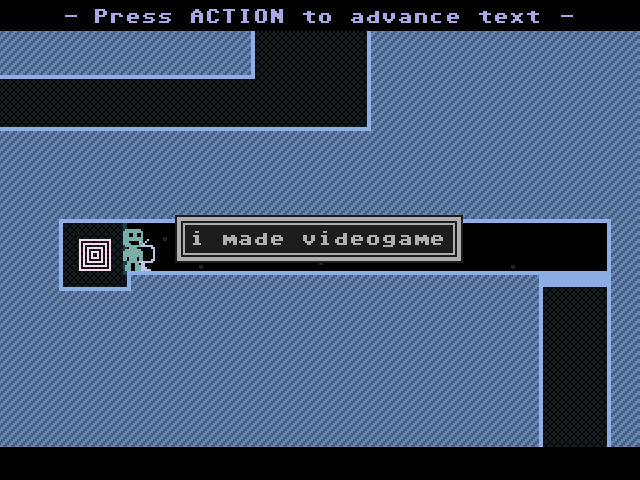 With this level, I wanted to do something that the original VVVVVV levels didn't: Provide a strong sense of place. The Laboratory was great fun (probably my favourite level), but it didn't look or feel a lot like a laboratory -- intentionally, I presume. I wanted to try something diffirent! Armed with the wise words of anna anthropy (http://www.auntiepixelante.com/?p=475), I set about building rooms that made it feel like you were descending into an abandoned mine. In the end, I don't think I quite made it. The problem is that providing a strong sense of place requires a lot of complicated visuals, and when I tried to combine complicated visuals and complicated challenges, the result was not pretty. Because of this, all of the pretty screens (the Mineshafts, Surface, Down and Around) have very simple challenges. All of the complicated screens (Gap Selection, Love Storage, Breakout) have visuals that are as simple as possible, and bear almost no resemblance to any logical, man-made structure. Despite this, I'm pretty happy with how the level turned out. It was fun! EDIT: Also, Paced Energy is awesome! Real nice level. It was difficult sometimes, but in a fun way, although in the room with the non-broken hearts, that trinket made me, well I couldn't get back before I tried like 50 times But that's the way it is, trinkets are supposed to be hard to get. Enjoyed it, the dialogue was pretty fun and the game was good difficultywise. There's one room where if you go left you can't go back but there's a trinket if you go down I assume. Would be nice to be able to go back/have an indicator that there's a trinket there first! It was pretty short but that's not really a complaint. This is pretty cool Loved the breakout room! This was a cool level! Looked quite nice and had some neat new concepts (the breakout room in particular). I loved the dialogue between Verdigris and Viridian, and the terminals too. The one in "Stash" was especially funny, and made me glad I persevered to get it. Room names also amused me, especially the mineshaft ones, which reminded me of bad horror sequel names ("Mine5haft" like "5inal Detination"). The difficulty in this level was quite high and was the only thing I disliked about this. Still, it wasn't so hard that I wanted to quit. Thanks guys! I'm glad you liked it. I updated the first post with some design "insight" that I forgot to write the first time around. Do you remember which room that was? 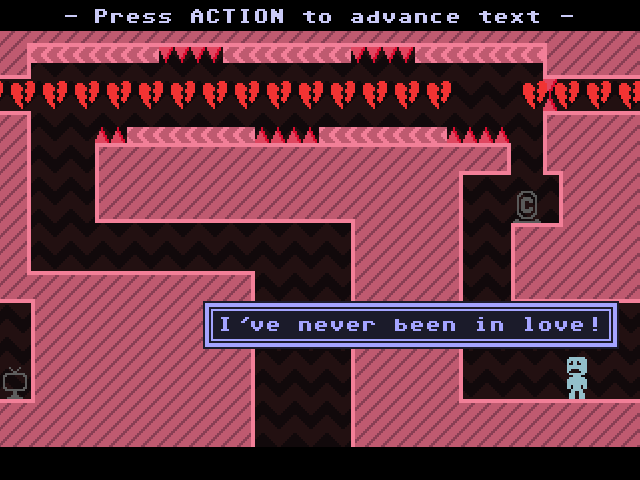 Nobody near me plays VVVVVV, so I wasn't able to see how a non-creator would go through the level. I tried to make it so that you would naturally be drawn towards trinket paths, but I'm not sure if I was successful. I think I might update this tommorow. Oops, just replayed it up to that part and realized that I'm simply blind. I was talking about "Love Storage" but as it turns out the trinket is on the same screen and clearly visible. I enjoyed this. The only trinket I didn't get was the one in Love Storage. I was curious and wanted a peek at the next room, only to discover that it's a one-way path. In "Down and around" I thought there might be something hidden in the top-right exit. I was surprised when I managed to go through it and appeared in the middle of a wall and slid back up to one of the earlier rooms. Viridian made a piss on that terminal. The level also gets five Viridians. Yay! Yay! Yay! Yay! I pissed on a terminal! I do programming, video compositing and music. Played until 'Breakout', then quit. It's a nice idea, but terribly implemented (imho). Still, the rest of the level was quite good, it's unfortunate that this one room ruins it!